The past couple months was dedicated to wearing the “Wedding Planner” hat. When a good friend of mine became engaged, I told her part of her gift would be her flowers. As in I would make them for her.This included the wrist corsages and boutonnieres in addition to those for the bridesmaids. Not to mention the mini-bride, junior bridesmaids, and flower girl. Flowers snowballed into decorating details for the entire reception. At first I was a bit shocked and concerned, but once we started working together, everything fell into place. 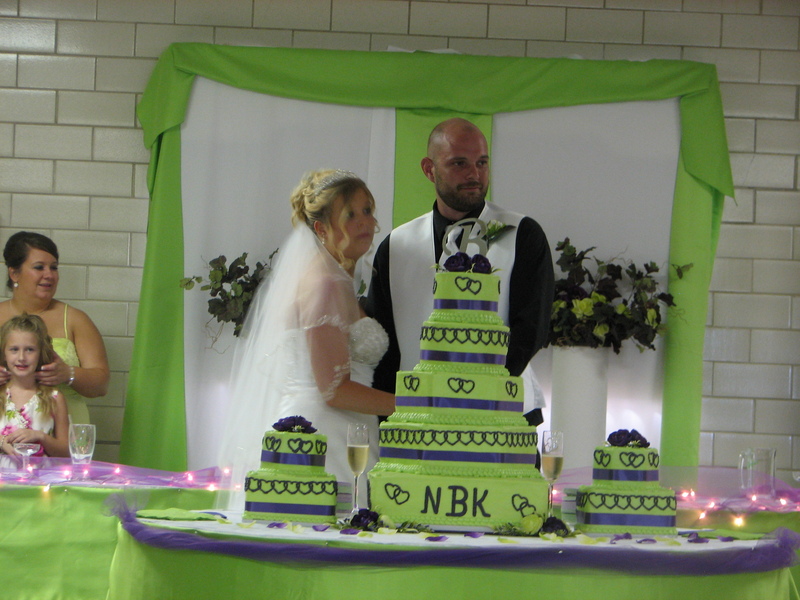 I spent almost every weekend since April working on some aspect of her wedding. The hardest part was over – she knew her colors and what types of flowers she wanted. 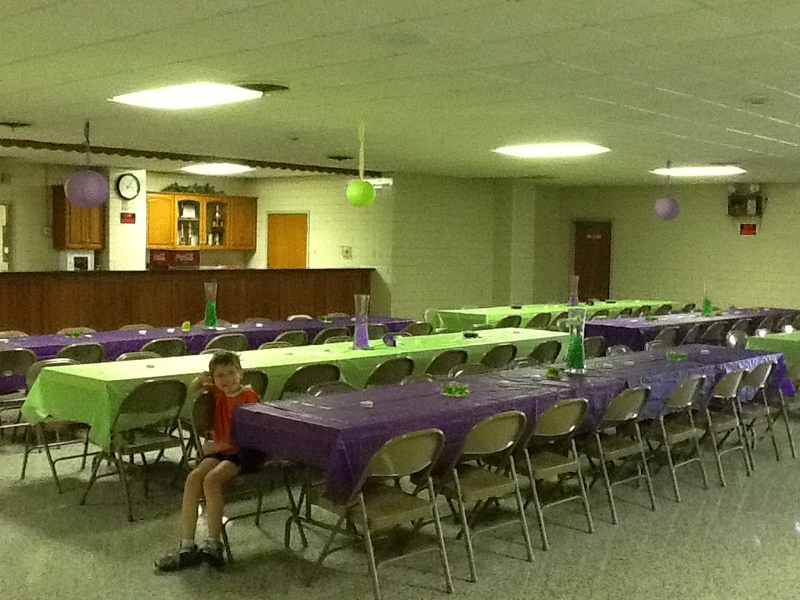 The rest was the minor headaches – tablecloths, center pieces, head and cake table, backdrop, etc. 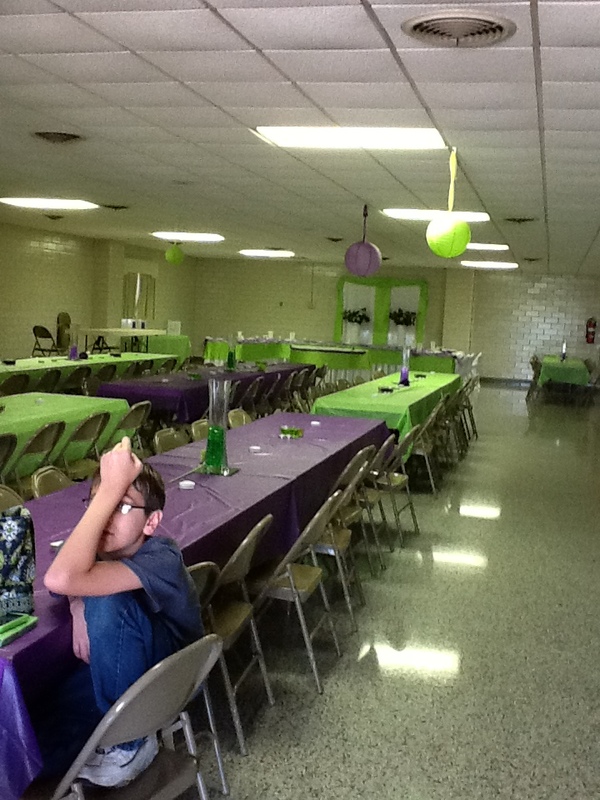 My children helped on Friday to decorate the community hall. Afterwards, my darling daughter comments that when it’s her turn to get married, she will not have green. To which my wonderful son agreed. 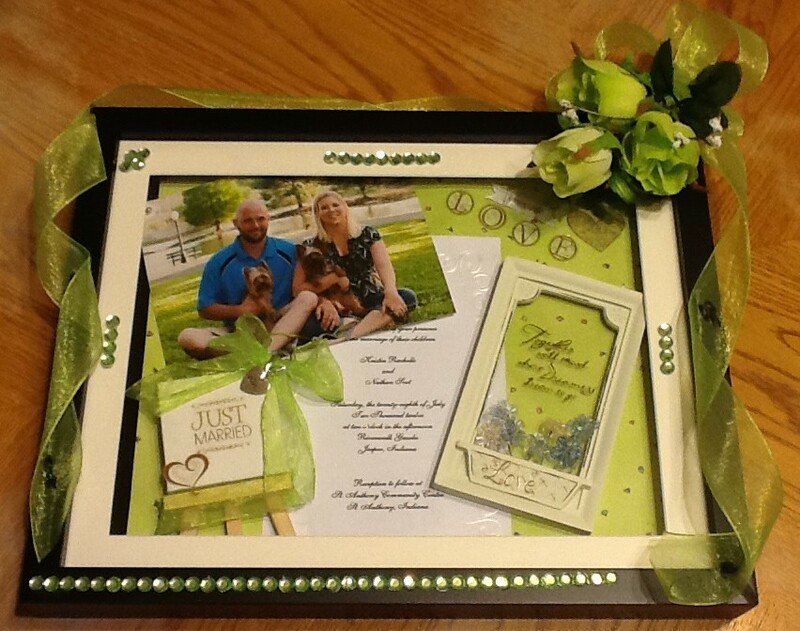 This is a close-up of the shadow box I made for them. I made their invitation with their names and date as the central visual point. I also used some left-over ribbon and roses to decorate the outside. The decorating took us four hours yet the take-down was a half-hour. The kids couldn’t believe the difference – I explained putting the decorations up everything has to be perfect, but taking down, as long as nothing gets broken, the decorations can go into any box available. 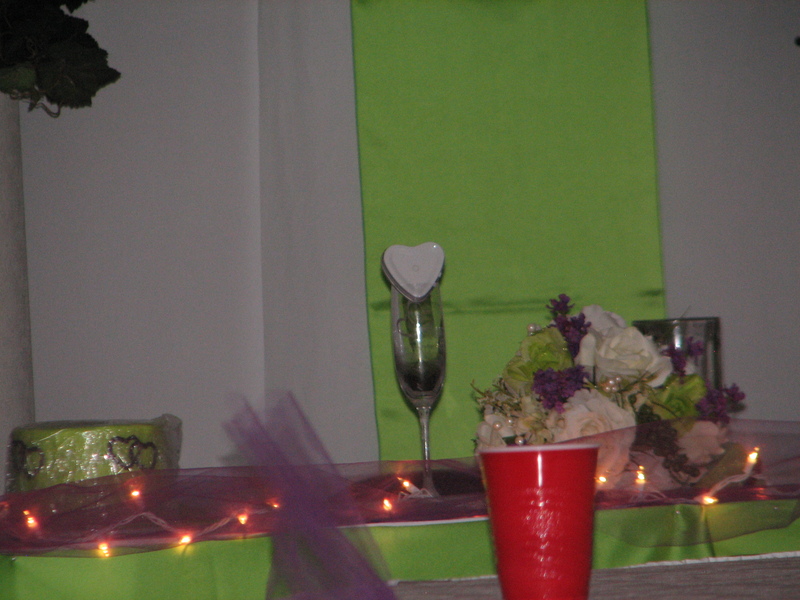 The head table and the backdrop. 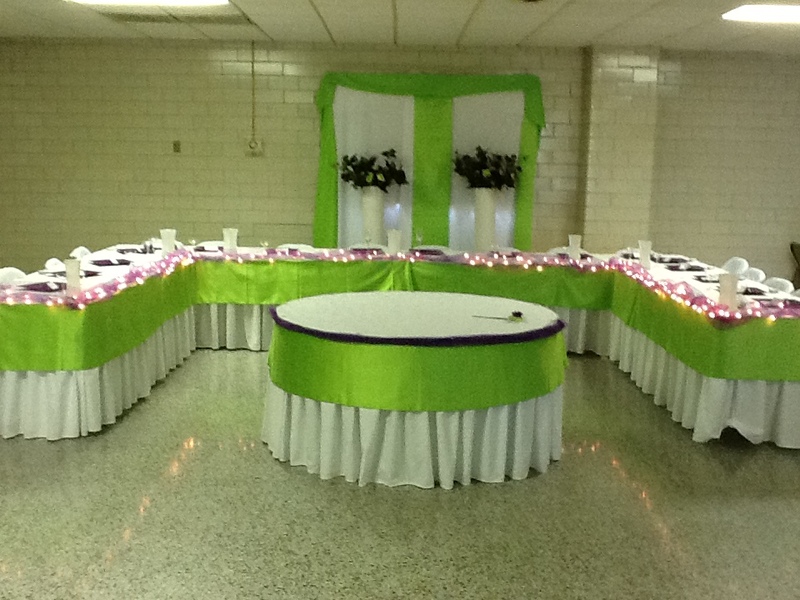 The view of the head table from the entryway. Sitting in the chair is my teenager, anticipating the moment we can exit the building as he watches me take a few shots. The newly weds posing for pictures. At the end of the night, both of their mothers came up to me and complemented on how everything looked. But I really made their nights when they asked how they could help take down and I told them to just go home and relax. Once upon a time, in a universe far, far away, I use to work in a home-based business of event planning. 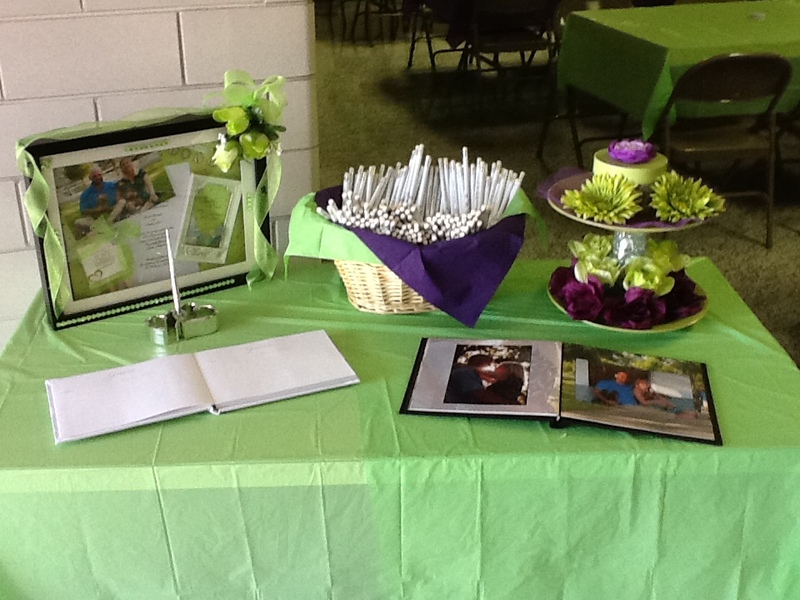 I have worked on weddings, birthdays (children’s and adults), graduations, showers, anniversaries, retirements, promotions, dedications, after-prom parties, sporting events, and even general “just because” celebrations. I enjoyed working with people and helping them realize their dreams for their special moments in life. Though the work was sometimes long, the results were worth it. I remember gathering up decorations, ribbons, bows, flowers, trinkets, pictures, and various other oddities which happened to come across my path for events in the making. From flowers to party favors, I had a blast. Why am I bringing this up now after almost ten years? Simply for the fact that I am again helping a soon-to-be-bride with her wedding. Though it’s only a small part in the planning process, it’s among the most important. After all, what is a bride to do with her nervous hands if she isn’t holding a bouquet? Working on her flowers, party favors and other small details she hadn’t thought of, the process has made me think back to the days when I would drive around town and walk miles of store floors on a quest to find a particular item. I can still feel the excitement build up within my stomach as if butterflies were taking flight while searching through shelves of items. From knickknacks to flower baskets to beads to confetti, I can recall each detail of each event. The sweet scent of the flowers in a floral shop for a retirement dinner. The strong smells of perfumes and cologne which seemed to follow me throughout the department stores as I put together gift bags for a woman’s 50th birthday. The sounds of the clanking metal on golf clubs for a man’s retreat. The process of sitting with the hostess, working through colors and themes, trying to get a picture of what their ideas look like or helping them form cohesive ideas. The whole process built with creativity and imagination. These are moments etched into my memory, being brought back to life as I work on the arrangements for the next event, as if my memories were part of a scratch and sniff sticker. With each cutting of a stem or inserting the ribbon, the past seemed that much closer. It was a time when I was working and enjoying every moment of it. I have some pictures of the flowers I have worked on and decided to share them with you. Due to the fact there is still almost a year before the wedding, and I wanted to offer her the ability to change her mind or add suggestions, none of the flowers are glued or taped permanently, so excuse any wires you might see. The left side is a bridesmaid bouquet – top and stem. The right sides are two wrist corsages I made for her to decide upon. 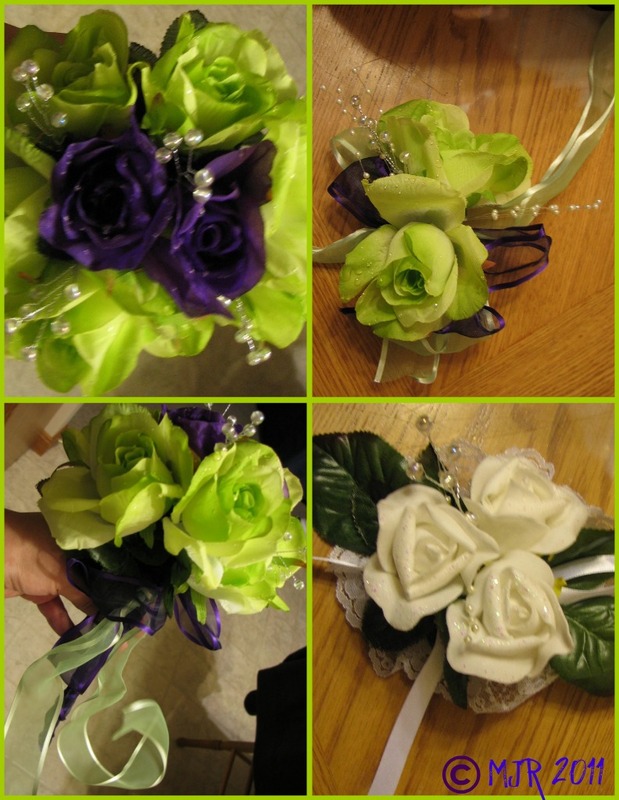 The top right is a ribbon corsage made of the same green and purple ribbons I used on the bouquet’s stem. Again, these are made for the purpose of seeing possibilities. Although, she has decided to keep the bridesmaids and her own bouquets as I made them, I have not cut them to the proper sizes. Hers is a solid green rose bouquet with the white pearl water droplets which I posted as part of my Photo Challenge: Round picture.